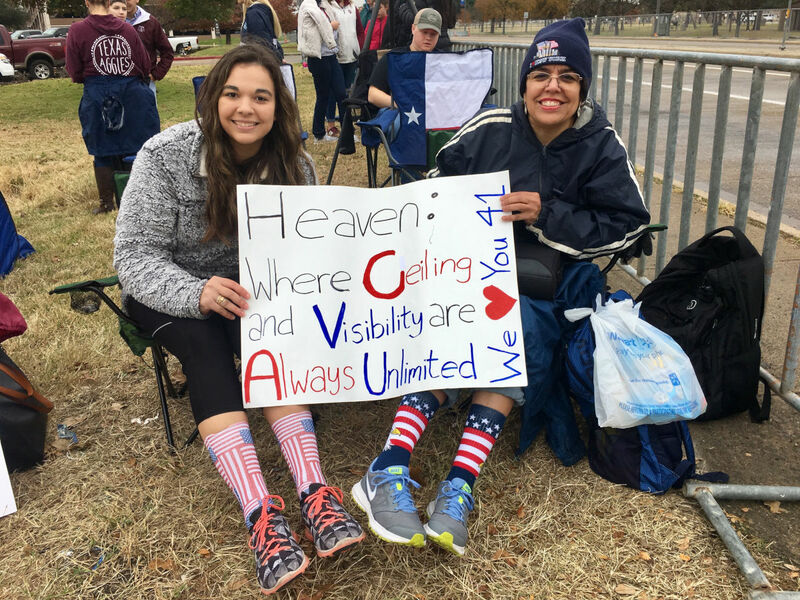 Had I given proper thought to hosiery when I headed to my old stomping ground, Texas A&M University, I would have tossed on my pair of blue and yellow tabby cat socks. 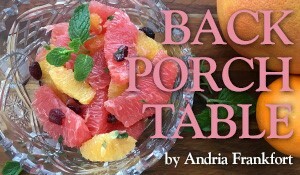 Or maybe the red polka dot numbers with lime green stripes. For this was a special socks kind of day. FLAG-DRAPED CASKET The casket carrying President George H.W. Bush is clearly seen through plexiglass windows. 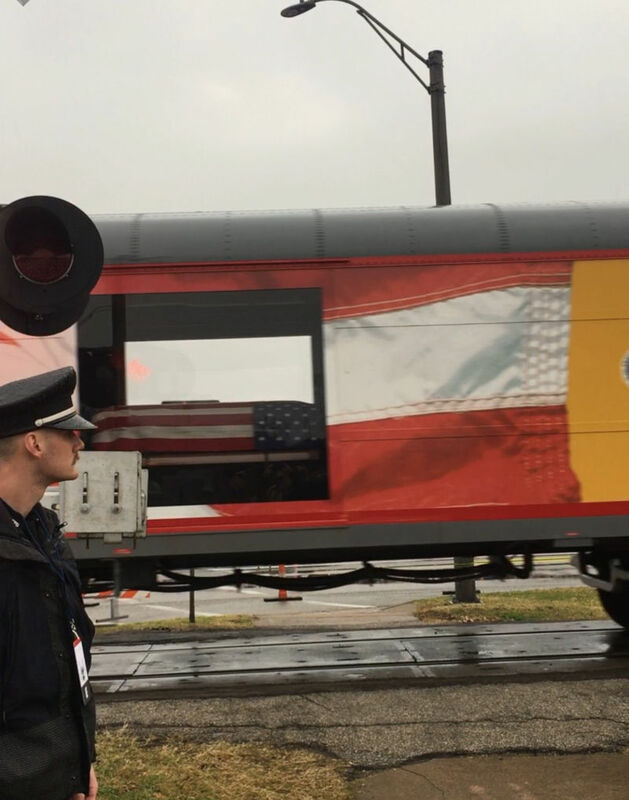 Along with the homemade signs, hats and T-shirts honoring former 41st President George Herbert Walker Bush, sock salutes abounded for the premiere hosiery diplomat as his flag-draped casket, in clear view through large plexiglass window, traveled by train to his final resting place in College Station. Whoops went up and cameras came out as haunting whistle broke through dreary skies. Onlookers jockeyed for vantage points, even rooftops, to pay respects to the former president. Socks were getting a bit soaked, though. 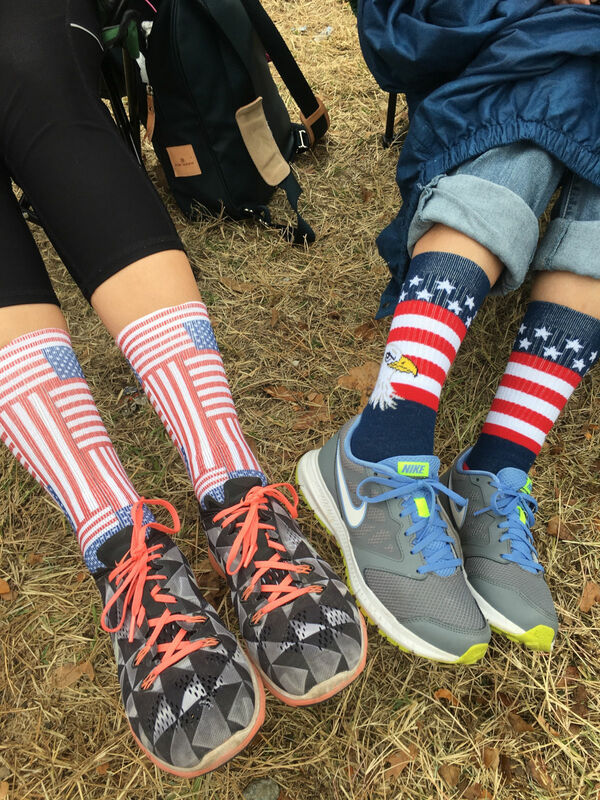 SOCK SALUTE Patriotic socks were popular footwear for those honoring President Bush, known for his fun hosiery. The weather was not Ceiling and Visibility Unlimited (CAVU), to borrow former Navy pilot Bush’s favorite acronym, meaning perfect flying weather. 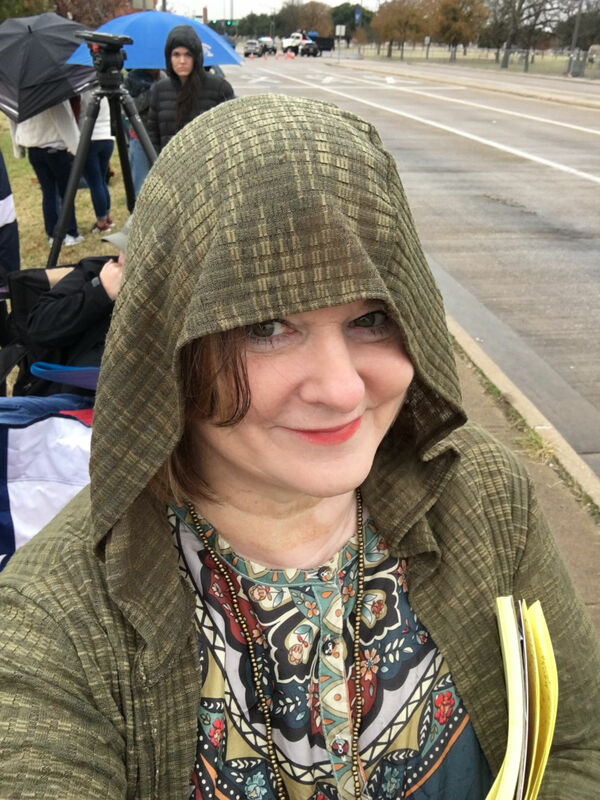 Temperatures dropped quickly and rain fell as the masses descended on my viewing spot, a grassy slope leading to the railroad tracks outside of a McDonald’s restaurant at the corner of George Bush Drive and Wellborn Drive. My quick talk with a policeman led to this coveted corner, the best place, closest to the railroad track. I stood there for six hours with a handful of people including Taylor. We held to our front line status. As train headlights became visible, onlookers reached for cell phones and cameras, recording history. They waved flags, signs. George Bush, former First Lady Laura Bush and daughter Jenna waved to the crowd. Gordon and Anastasia Hitzfelder, San Antonio area residents, admitted goosebumps. 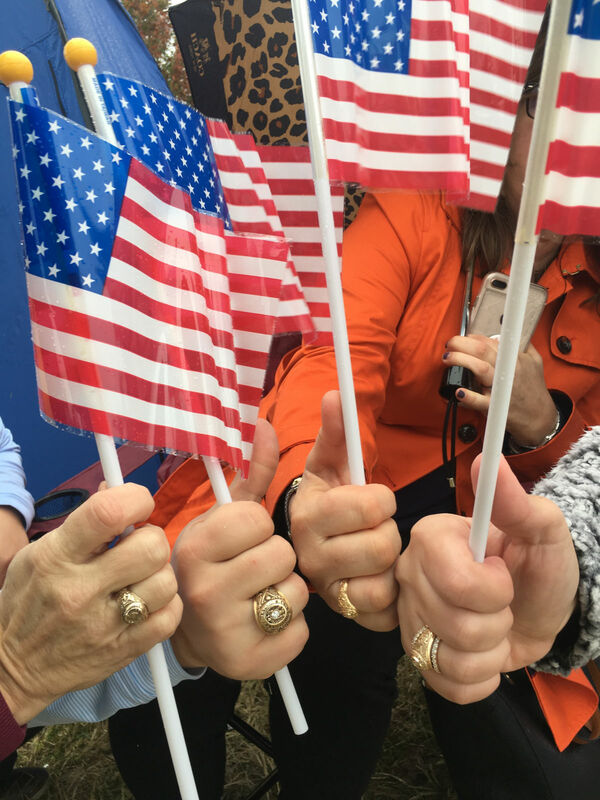 PATRIOTIC AGGIES Onlookers wearing Aggie rings show off their pride for the school Bush loved and called his final resting place. 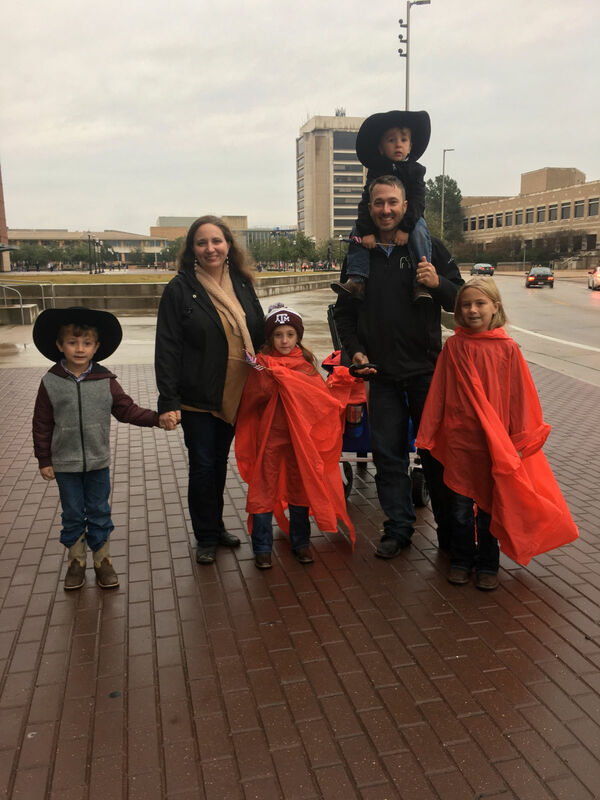 “Yeah, I just think they’re an amazing family,” agrees Taylor, who saw the plane carrying Bush, Special Air Mission 41, as it flew over College Station the day it headed to Houston for the funeral at his hometown church. Read more about the ceremony honoring George H.W. 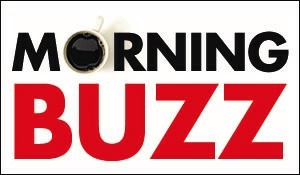 Bush at Ellington Airport on Monday morning, Dec. 3 and at City Hall that evening. 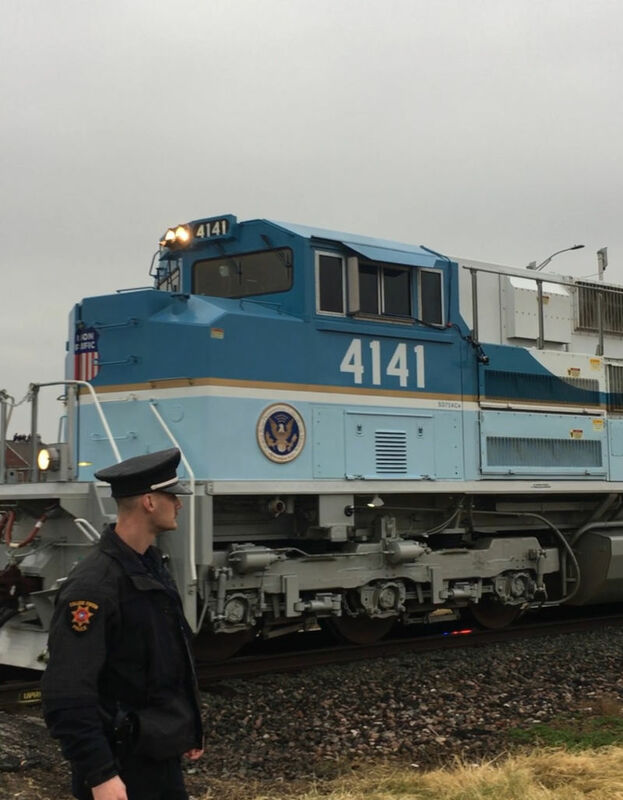 THE PRESIDENT’S TRAIN A police officer watches as the train passes crowds. AGGIE CATHY Writer Cathy Gordon, who earned a journalism degree at Texas A&M University, was one of many onlookers when the train carrying Bush passed through College Station. 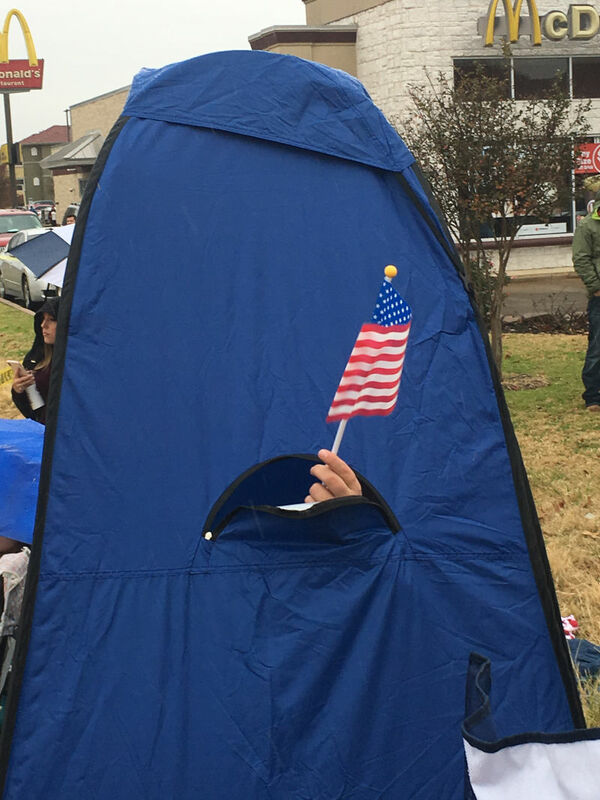 TENT PATRIOTISM An onlooker escapes the rain while waiting for the Bush train.